Al Ain's Bandar Al Ahbabi was one of few players to come out of this game with any credit. 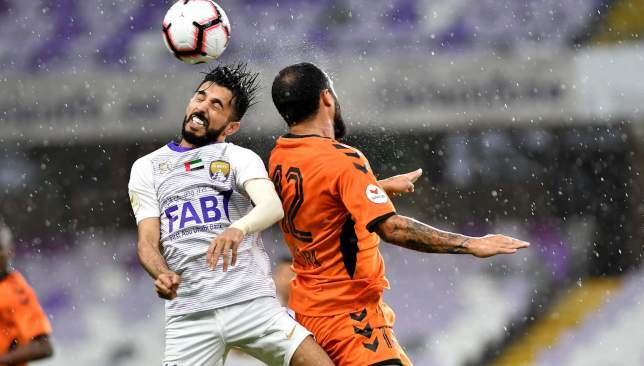 Al Ain’s Arabian Gulf League reign looks to have finally come to an end following a 4-0 home defeat by Ajman. 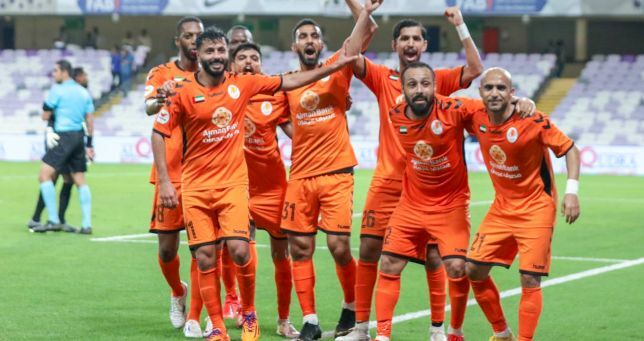 As the rain poured down at Hazza bin Zayed Stadium, so did the goals for the Orange Brigade, who were the only colourful thing on a dark day for the Boss. 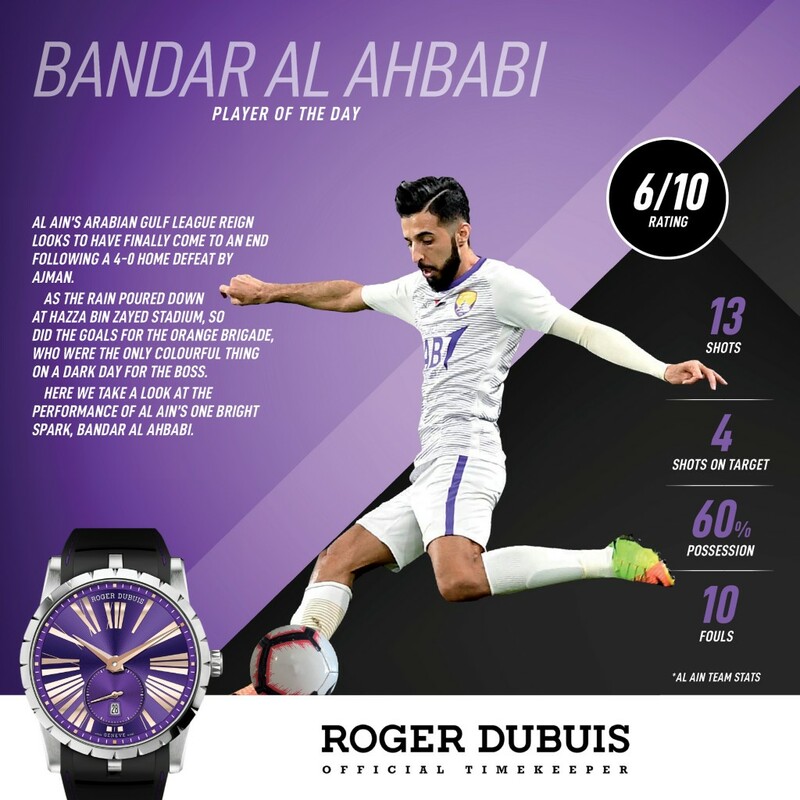 Here we take a look at the performance of Al Ain’s one bright spark, Bandar Al Ahbabi. A spirited fightback from 2-0 down to draw 2-2 with Al Duhail during the AFC Champions League in midweek was supposed to galvanise a squad still broken by their 5-1 beating by Al Jazira in Al Clasico. But, instead, a succession of errors and misfortune befell the Boss. They went behind after half an hour, Stanley Ohawuchi profiting from a horrendous mix-up between Mohammed Fayez and Ismail Ahmed, rounding Khalid Essa to net. Abdullah Malalla made it 2-0 just before the break when his fierce strike took a wicked deflection off Mohanad Salem and left Essa helpless. The hapless stopper then unwittingly contributed to the Orange Brigade’s third six minutes into the second half when Adil Hermach met Vander Vieira’s corner with a thunderous header that came back off the bar, hit Essa and went in for an own goal. Viieira then profited from yet another Ahmed error, seizing on his under-hit back-pass and rounding Essa again to slide home. It’s difficult to put any gloss on this performance, but if the hosts were ever going to claw their way back into the contest, Al Ahbabi always seemed the likely catalyst. His relentless energy up and down the right wing – as well as his forays into midfield – dragged opponents all over the place. And with target man Marcus Berg providing a beacon to fire balls into, the right-back’s long bombs and crosses were proving the most effective method of attack for the hosts. Only committed goalkeeping, defending and an off-day for the Swede prevented the Boss from breaching the visitors’ goal-line. 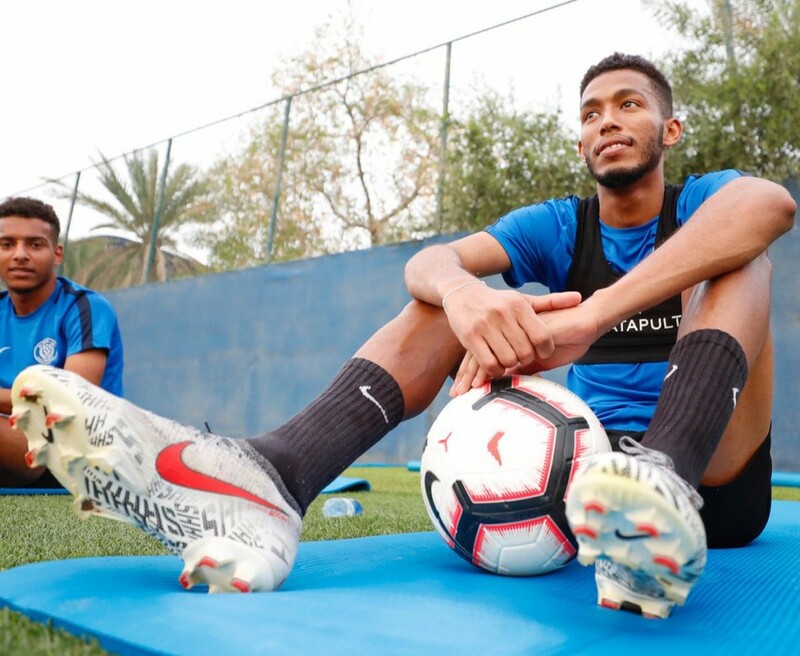 Additionally, though it may not be much comfort, he was the only player in the back five who was not directly at fault for at least one of the Ajman goals. The speedy defender is not often caught out for pace but he was during the first half by the fleet-footed Mame Thiam. 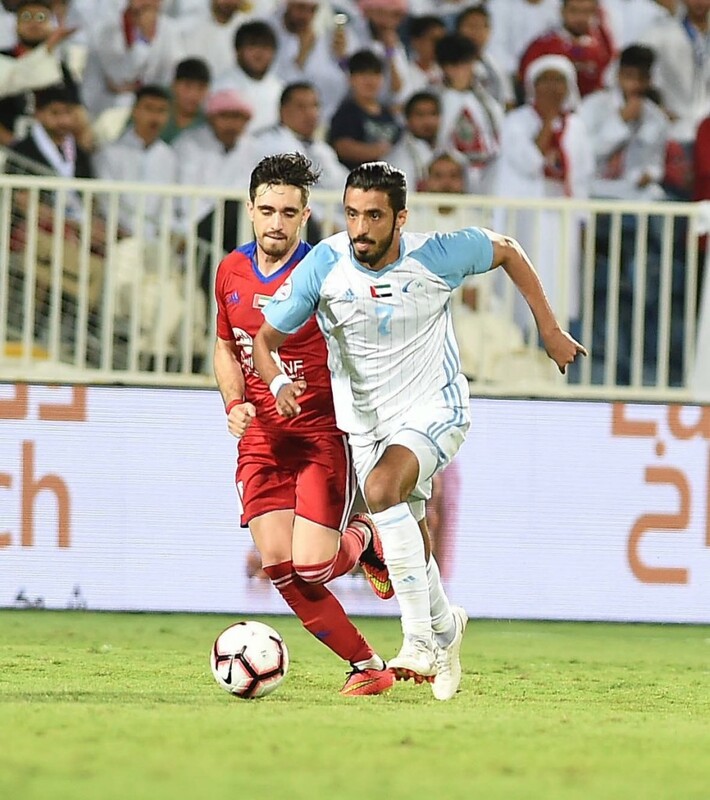 The Senagalese showed good skill in a tight space to fashion a chance, and the former Bani Yas man had no choice but to manhandle him to the ground. Al Ahbabi could have seen yellow for the foul, he was fortunate in the extreme not to be cautioned for kicking the ball away in frustration, especially as it was seemingly aimed in Thiam’s direction. 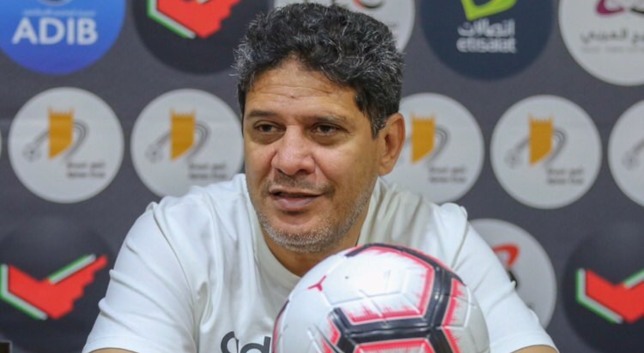 Arabian Gulf League leaders Sharjah were made to breathe a sigh of relief after they came from behind to defeat “unlucky” Bani Yas and head into the midweek showdown against champions Al Ain still unbeaten, according to coach Abdulaziz Al Anbari. The King fell behind in just the third minute at Bani Yas Stadium through winger Suhail Al Noubi’s smart finish. Ex-Palermo playmaker Igor Coronado then moved onto 13 top-flight goals from a sensational debut campaign, saving the day against promoted opponents with a first-half one-on-one and nerveless second-half penalty kick. “Thank God for the result and mabrouk [congratulations] for Sharjah for the win,” said Al Anbari, who next welcomes the Boss on Wednesday. 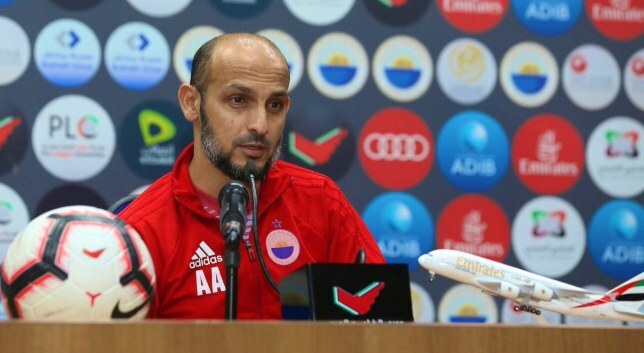 “Bani Yas were unlucky, they presented a great game and a wonderful level like they have all season. “It was a very tough match. We studied Bani Yas well and managed to overcome the shock of an early goal. “We must now forget this match and focus on the next game, against Al Ain. I wish success to the team and to continue this journey with positive results. “There are 18 points left to play for and this is not simple. High concentration is required, especially with the end of the league nearing. Sharjah hold a nine-point advantage over second-placed Shabab Al Ahli Dubai Club. They last won the league crown in 1995/96.